Dancing Around the World: Completed! Collaboration with Nejla Yatkin. “Dancing Around The World” is a worldwide 20 city tour to explore, intimately and broadly, the interaction of people, movement and the environment through dance. We are exploring what moves people in order to foster an understanding of how urban environments shape our expressive lives. During this yearlong endeavor, we engaged, connected, and collaborated with citizens, visitors, centers, sites, and the environment. In this project Nejla and I explored the five themes of geography long discussed in social science literature as well as long realized by observers of societal processes. These include: 1) location, 2) place, 3) human environmental interaction, 4) movement, 5) regions; all viewed through the prisms of dance, video, and online tools. Curious for more information..check out this PDF. For more information follow us at NY2Dance.com and on our Facebook Page. Our Monitoring and Evaluation Plan can be found here. See all our Video mini-movies below. This is an evolving project in two parts. Part One- Is an interactive dance performance involving video projection mapping and sound. 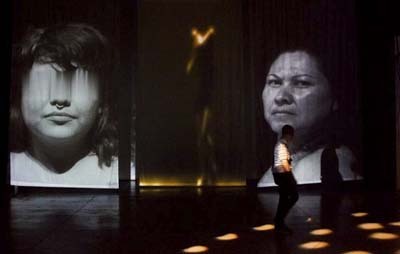 The second part is a 3 panel mapped projection surface that interacts with participants position in front of the projection installation. Here you can see what I've seen. An instrument no one can see but all can play. Currently I'm creating the apparatus for someone else to be the instrument. Participants enter a space and discover that they are making sounds. The goal is to have people realize they can make better music by playing with each other. Augmented Reality looms in our future like Godzilla. Take portraits of people just as an object is tossed to them. Take portraits of people. Make Gifs. Install on corners of the world for an Augmented Reality Corner dance. This is part of a future VR graffiti project. In this experiment, the sun light is projected onto 4 walls. Light spectra provided by NASA in the 171, 304 Angstrom range. Using MaxMSP solar wind recordings will be conformed into the human auditory range [20-20kHz]. Participants will be invited to enter a room to see and hear what their offspring will take for granted. Follow up project will produce the sounds of the Heavens. Jupiter, Neptune,Saturn and Mars will play as a quartet. If it all sounds groovy we may hear a Nonet or Decet maybe just a Octet depending on International Astronomical Union (IAU). Lose Control a interactive virtual Tornado. In the near future participants will be able to guide a AR tornado as it interacts with other RTIAR elements. Bring Your Own Unicorn (BYOU) because you will need it and the fantasies that are projected on movie screens by billion dollar entertainment multinationals will be made by you and given life as easily as telling a story to a 5 year old. We will become the Production companies, the Artistic directors, the FX house. Our verbal doodling will live on after we have gone to sleep. Digital Children given life and let loose in a virtual world. We are entering a present of Augmented Reality where what we engage with will respond to us and to other virtual realities. Gaming will not be limited to the context of a digital window sitting in a home or on a phone but surround us. We will be immersed in it. There will be Virtual layers of existence (VLOE) which we can choose to perceive. These virtual layers will have many of the qualities of modern existence. There will be Physics, Economies, Business, Commerce and Drama. 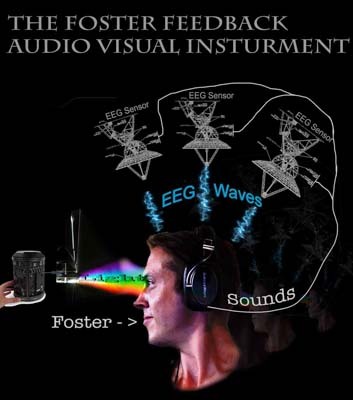 Foster, who is blessed with synesthesia, will view visual input and provide EEG output which will be used to further modulate sounds and visuals back into Foster, thus creating a feedback loop that he may well enjoy.